First off, an instant cappuccino machine is nothing like an espresso machine that makes cappuccinos. An espresso machine is a big, highly engineered and hard-to-operate machine that makes espresso by heating water in a boiler and creating high pressure that forces the water through the coffee grounds. Real cappuccino contains espresso, steamed milk, and froth. An instant cappuccino machine is a big machine with a hot water reservoir that mixes the water with instant cappuccino powders and whips the two together before dispensing it into a cup. Instant cappuccino contains mostly hot water, sugar, nondairy creamer, and flavoring. Now that that’s out of the way. 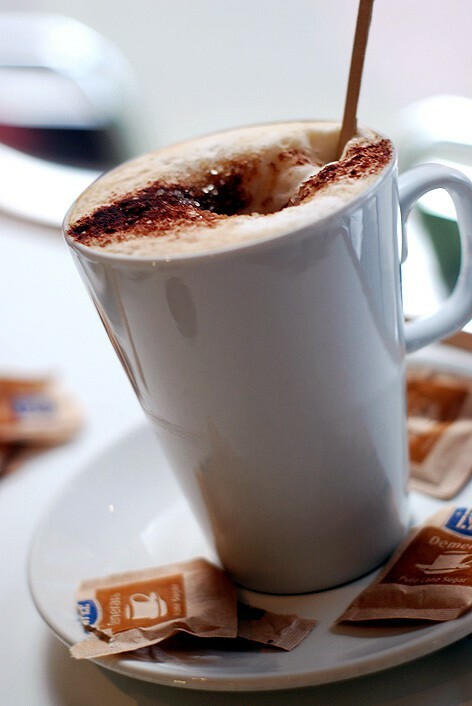 Consider Your Drinkers – make sure they are wanting instant cappuccino instead of real cappuccino. Most coffee shops don’t want to offer instant cappuccino, but some definitely do. 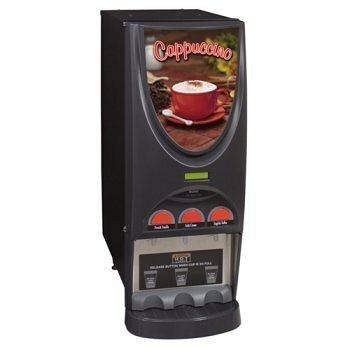 Many restaurants, cafeterias, schools, and convenience stores definitely want instant cappuccino machines. Consider Who is Making the Drinks – espresso machines either requires a barista who can grind, tamp, steam, and froth (for a semi-automatic machine), or somebody who can push a series of buttons (for a super-automatic machine). Instant cappuccino machines just require pushing a button for the desired flavor. Instant cappuccino machines are often set up as self-serve for the customer. How Many Flavors – this is one of the biggest decisions. Instant cappuccino machines come in anywhere from 1 to 10 flavor configurations. We’ve found that a 3 flavor machine is fine for most applications, and 5 is good for larger applications. The number one seller is almost always French Vanilla. After that, customers like some kind of cocoa flavor. The third flavor – and the fourth, fifth, etc. – are never big sellers. Therefore, a three-flavor machine with a rotating third flavor is usually a good choice. Push-Button or Portion Control – this is the next consideration. Push-Button means the button is held down and then released when the correct amount has been dispensed. Portion Control machines can be calibrated for different cup sizes. High volume, fast-service locations would find the Portion Control option very handy. It reduces waste and mistakes and allows the operator to step away from the machine and do other things while the cup is filling. Design – newer models of cappuccino machines like the Bunn iMIX and the Curtis PCGT that feature a rounded front panel and more vivid graphic displays. This may be important for locations that want to catch the eye of the consumer, but they won’t be worth the extra expense if the machine is sitting in the back of a restaurant. New or Used – we sell both. Used, refurbished machines typically cost about half as much as new. Instant cappuccino machines don’t have any major part that will go bad and make the machine worthless. They can always be repaired, usually for less than $100. Our used machines come from reputable refurbishers. We hope this article helps. Please contact us if you need further help. 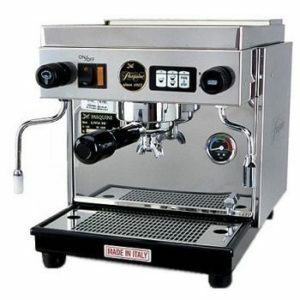 We sell instant cappuccino machines by Bunn, Curtis, and Grindmaster/Cecilware. Photo of Cappuccino by Laia Solanellas via Wikimedia Commons.